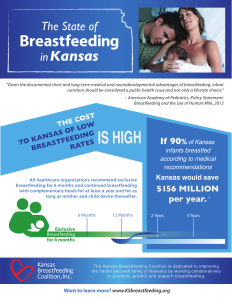 The Kansas Breastfeeding Coalition has issued a report The State of Breastfeeding in Kansas to describe the current breastfeeding rates as well as suggested actions for improving these rates. Please share this report with local governments, hospitals, employers, schools, civic organizations, faith-based organizations, child care providers and groups that support or serve families. We want to reach a large audience and your help in disseminating the report, along with encouragement to take action (see page 4 of the report), is vital.